Alfalfa County, located in the northwestern part of Oklahoma, was first settled by Mennonites in 1905. It once had two Mennonite churches, one of the General Conference and one of the Church of God in Christ, Mennonite. In 2006, only the Pleasant View Mennonite Church (CGCM) in Goltry remained. The Mennonite settlement in this county extends into Major County. Bergen, J. W. "Alfalfa County (Oklahoma, USA)." Global Anabaptist Mennonite Encyclopedia Online. 1955. Web. 21 Apr 2019. http://gameo.org/index.php?title=Alfalfa_County_(Oklahoma,_USA)&oldid=132577. Bergen, J. W. (1955). Alfalfa County (Oklahoma, USA). Global Anabaptist Mennonite Encyclopedia Online. 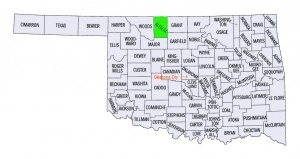 Retrieved 21 April 2019, from http://gameo.org/index.php?title=Alfalfa_County_(Oklahoma,_USA)&oldid=132577. Adapted by permission of Herald Press, Harrisonburg, Virginia, from Mennonite Encyclopedia, Vol. 1, p. 51. All rights reserved. This page was last modified on 11 August 2015, at 12:54.